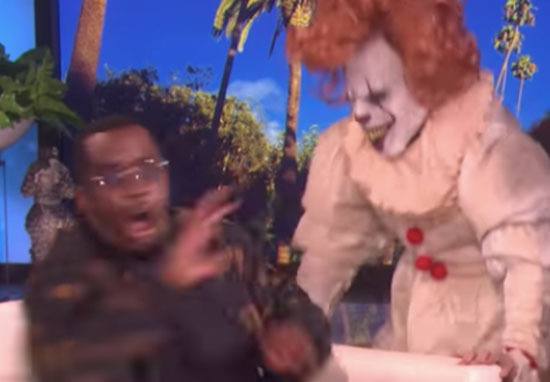 American rapper, Diddy, got a terrible fright when he was surprised by a clown on The Ellen Show. Halloween’s just a few days away, making everything in life seem a little bit more creepy. Cobwebs and spiders hang in every window, the TV schedule is full of horror movies, and everyone’s dressing up in blood-drenched costumes. It’s just generally quite a scary time of year, and it’s worse when you get scared when you’re not expecting it. Well, worse for you. Usually it’s extremely entertaining for everyone else. To be fair, there’s something inherently creepy about clowns. Everyone was a little on edge when people started spotting clowns hanging around in various places, and let’s not even get started on Stephen King’s IT. Pennywise isn’t the type of character you want to befriend. Despite this, the unsuspecting rapper appeared on the chat show where he expressed with confidence he was most certainly not afraid of clowns. Ellen raised the topic with Diddy, mentioning Halloween is approaching and she’d heard he was afraid of clowns. No. Impossible. Because I’m a black man. I have so many other things to be fearful of. A clown is not going to scare me. I’m not afraid of clowns. 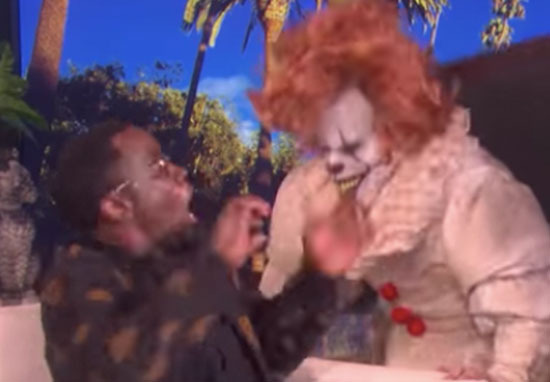 Of course, Ellen wasted no time in testing the truth of his statement by having someone in a clown costume burst out of a box right next to Diddy’s chair, immediately after he’d confirmed he wasn’t afraid. Admittedly, having anyone burst out at you unexpectedly is enough to make you jump, and it all happened so fast, Diddy might not have even had time to register it was a clown, but either way, his reaction was priceless. The rapper leapt from his seat and jumped across the studio floor before throwing out a karate-style kick, as if he’d actually been prepared the whole time to fight any monsters which might come his way. Seemingly trying to save face, Diddy then burst into a dance, which just made the whole scenario even funnier, while the show’s host sat laughing away in her chair, clearly pleased the plan to scare Diddy had worked. You know I woke up this morning and I said I want my life to be full of surprises. Ellen, I thank you. You really affected my street cred with that. Ellen later shared the clip on Twitter, saying it was one of the best prank scares she’s ever done on the show. Nothing was more satisfying than watching @Diddy’s reaction. This could easily be one of my favourite scares. Poor Diddy. At least his terror made for some excellent viewing.